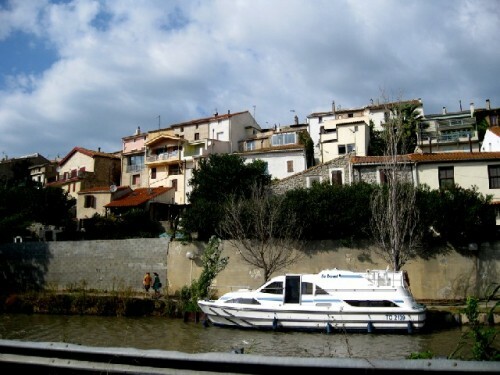 Paraza is located next to the Canal du midi and attracts visits by tourists on boats and barges. 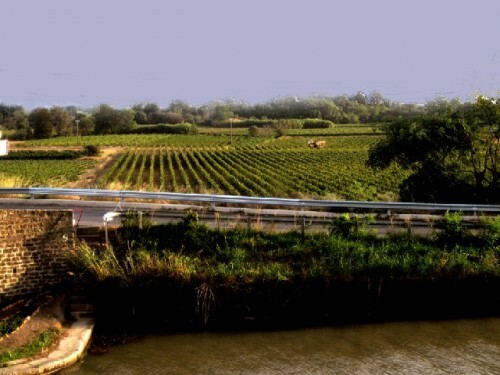 Paraza’s fields of grapes are spread out on the other side of the canal. Along the narrow streets and alleys. The accent of color is typical of the village. 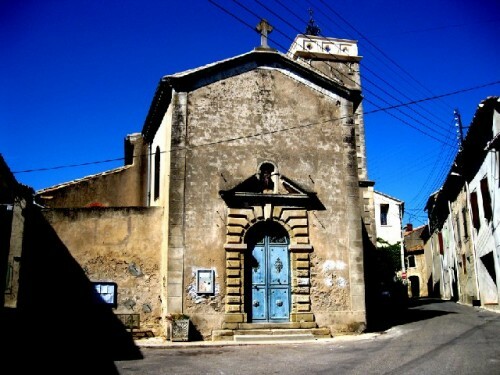 The church has been the center of village life for centuries. The local stone in the church that Werner would like to offer to a sculptor during the next symposium. 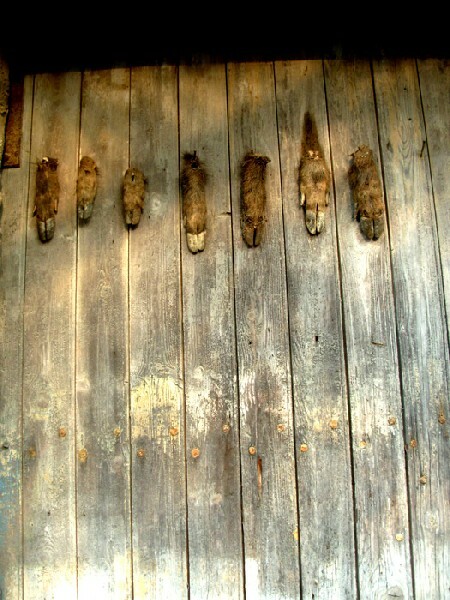 The door of a small house. 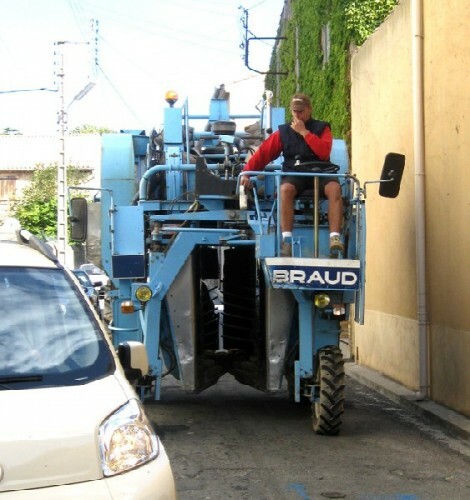 These enormous machines are used to harvest the grapes but have reduced what was once hand labor. The Chateau seen in the distance from our guest house. The house of a former manager. A bottle of the fine wine of Paraza was rich and flavorful. Dinner with our hosts Werner and Christine Endriss in the lovely cafe by the canal. The charming British hostess of the Paraza cafe. Christine and Dorothea Fleiss danced the night away. Toi claps to the beat as Istvan plays the blues. Sandie Mendes and Ricardo Da Silva hosted a wonderful party that lasted well into the night. 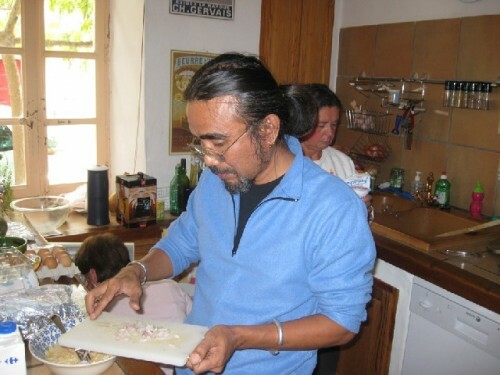 Ricardo and Sandie in their kitchen preparing for the paella party. 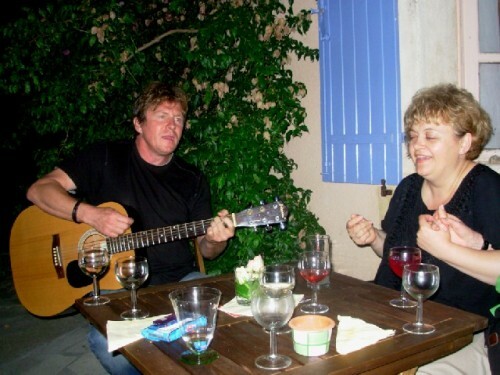 Dorothea and Istvan singing and making music. 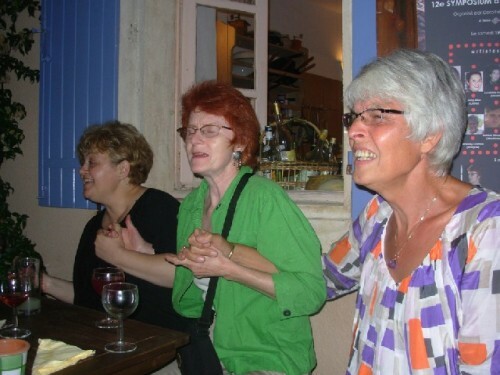 Dorothea, Astrid and a neighbor/ host, Annaben enjoying the music. Astrid interviewing the Mayor of Paraza. 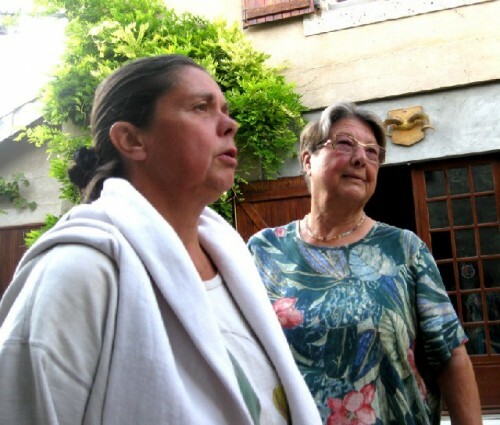 The Mayor with Astrid and Dorothea welcomed the artists to his village. 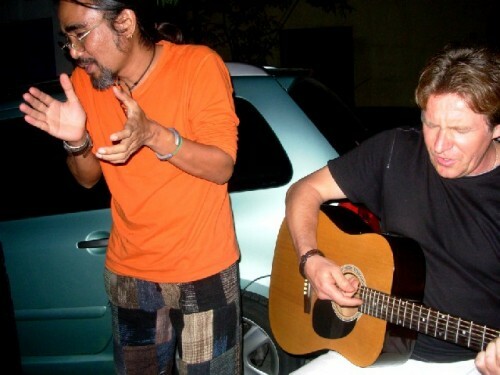 Our host, Dirk, with Takata. Our hosts Dirk van der Elst and Mireille Schellaert during an excursion to Minerve. Enjoying a family style meal. Lyudmila Dakhova endured a 30 hour bus ride from the Ukraine to Paris to join the group mid week. Interacting with Ursula Kara and Johanna van Dijke who have settled in the village. The group posed during the vernissage. The Hungarian artists at the Narbonne Beach. Kalman and Istvan taking a dip. Werner relaxing during one of our excursions to local villages. Werner saying a few words after dinner. Toi making a traditional Thai curry. Toi is a painter and performance artist. Toi and Takata during a day trip. Takata spent much of his time thinking. 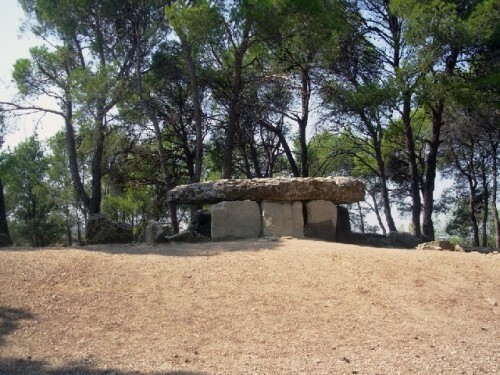 A Neolithic tomb from the many prehistoric sites in the region. In association with the organizations Le Pont and Le C.L.A.P. 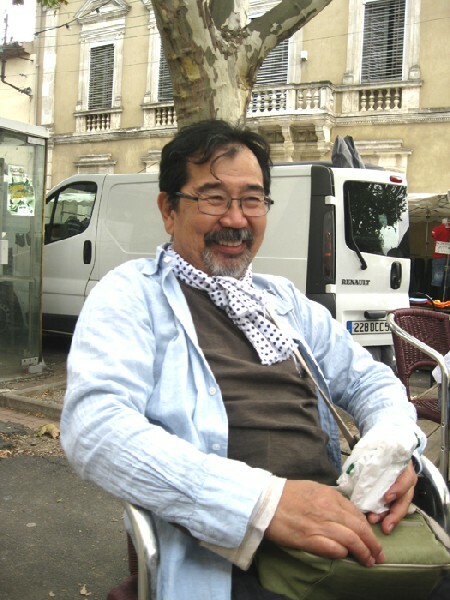 Participating artists: Lyudmila Dakhova (Ukraine), Dorothea Fleiss (Germany), Padungsak "Toi" Kochsomrong (Thailand), Istvan Korbely (Hungary), Maklary Kalman (Hungary), Mathe Rainer (Hungary), Takata Yoshiki (Japan). 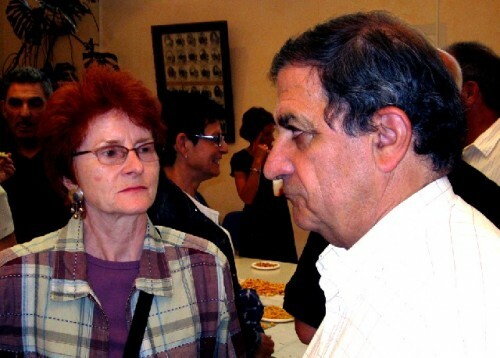 Journalists; Charles Giuliano and Astrid Hiemer, (USA). 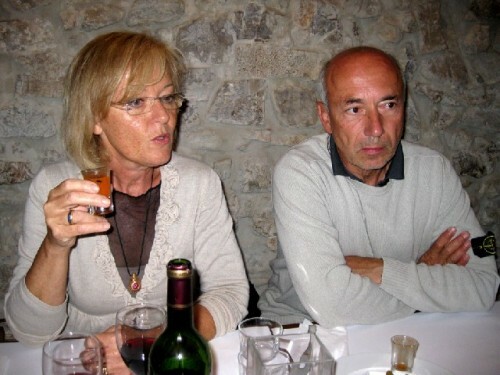 When Astrid told me that Dorothea Fleiss had invited us to the ten day long 12e Symposium d'art contemporain September 12 through 21 in Paraza, France the first question was where is Paraza? Followed by what is Paraza? Then, why Paraza? 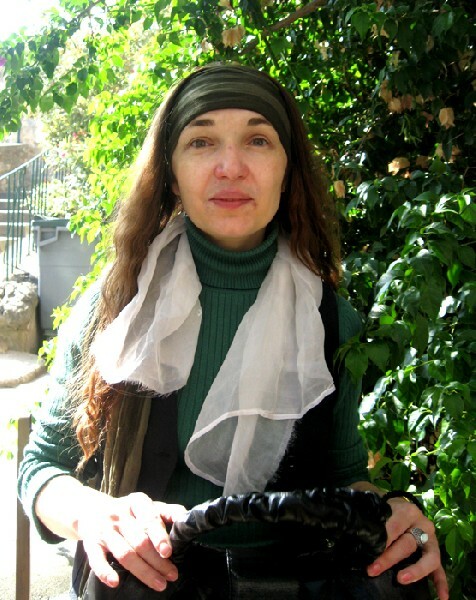 Several years ago Astrid met Dorothea, a Romanian born artist who lives in Stuttgart, Germany when not globe hopping to participate in exhibitions and organize international symposia. The occasion was the first of two events organized in Boston by the artist/ entrepreneur, Mary Sherman International Opportunities in the Arts. Last spring Dorothea and her daughter Suzie stayed with us in the Berkshires while traveling to participate in the colloquium in Boston. It is often said "There's something about Mary" when describing the daunting energy and creativity of Sherman and her global outreach through the organization Transcultural Exchange. Its basic concept is for global networking of artists through residence programs and exhibitions. Over three day weekends Sherman's meetings, held two years apart, brought together many organizations interacting with and inviting artists to participate. These ranged from official government and foundation sponsored programs, with juried application processes, to intimate and very personal residences where sponsors invite participants to come and stay in their homes, barns, and studios. To break bread and discuss ideas over the kitchen table. The most enticing aspects of these initiatives are opportunities for artists to travel, develop language and communication skills, and network to have their work seen and appreciated internationally. A primary focus is to create site specific work. Often residences come with an expectation of exhibitions and donation of some of what is produced to the host, foundation, museum, or sponsors of the program. The concept is to visit and work but also to leave behind a tangible legacy that, over time, accrues into collections and related exhibitions. This aspect raised a conundrum for us. While we are artists, currently, the work is primarily focused on photography, documentation, and critical writing. So what we have produced evolved after the period of residence. The information and images created in Paraza will develop as we post articles to this site and work with images in Photoshop. A selection of this work will be printed and exhibited. But we wondered how we would actually interact with artists spending most of their time in the studio. Just how might we contribute and pull our weight in this creative process? During the extent of our visit, however, we were fully engaged in the dynamics of the daily events. 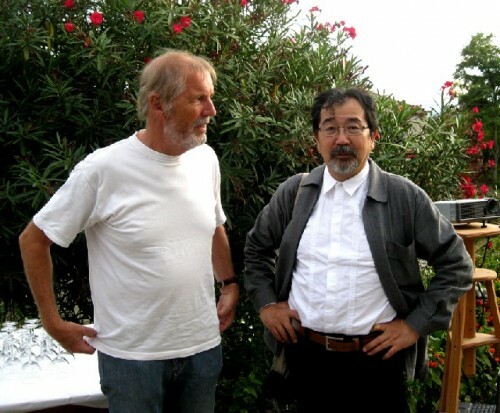 In addition to visits to the studio, to observe the artists at work, we interacted during meals, breaks outside the primary residence, and song filled nights after dinner when Istvan Korbely and Maklary Kalman played their guitars and sang traditional Hungarian songs with the occasional American blues. Some of these sessions lasted well into the night often fueled by copious spirits. These celebrations included a joyous paella party hosted by the next door neighbors of Christine and Werner, the Portugese couple Ricardo and Sandie Mendes. 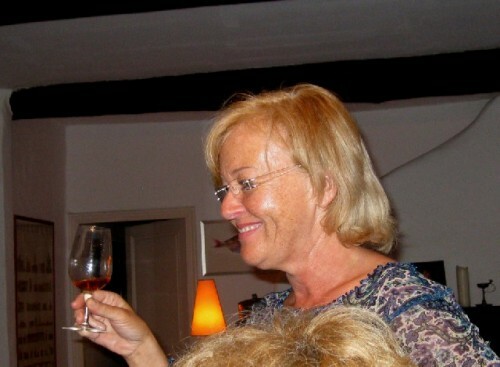 Many in the village - Anneben Ogier, Hilde Boonstra, Johanna van Dijke, Ursula Kara - frequently dropped by for a glass of wine or joined communal meals. When the invitation to the Symposium was first extended it prompted discussion. The ten day event was scheduled for immediately after Labor Day weekend. We were flat out and exhausted from an intense season of covering the arts in the Berkshires. This capped by the annual Labor Day weekend Tanglewood Jazz Festival. The idea was to finish that coverage, pack, and just a couple of days later, Wednesday, take three flights ending in Toulouse. 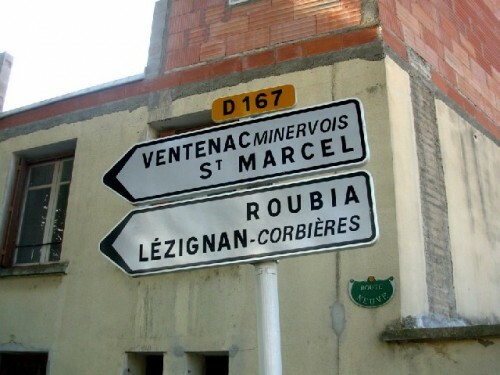 To pick up a car and after a day of recuperation and exploring Toulouse, drive on to find tiny Paraza a couple of hours away. The plan was to spend a week in a village of some 560 inhabitants, speaking 16 languages, next to the Midi Canal. This was nothing like our prior trips to London, Paris, Vienna, Rome, Prague, Barcelona, Florence, Venice, Berlin, Dakar and other major cities. There were no visits to great museums or international art fairs like the Venice Biennale or Documenta. Why would one want to spend a week in a village? 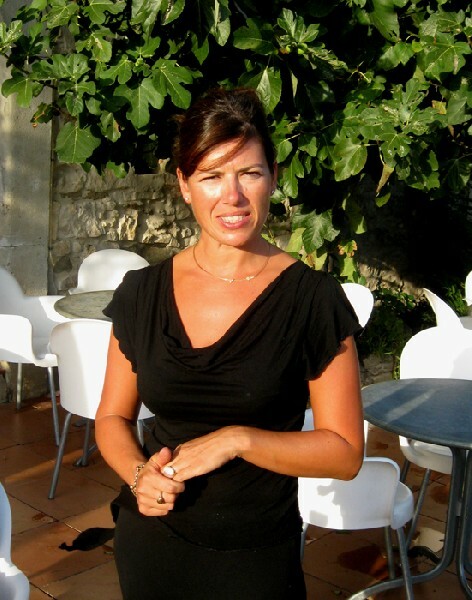 We added on another week of travel in Provence and the Cote d'azur ending in Cannes and Nice. What's not to like about that? There was also the aspect of being cut off from the outside world. For a media junkie it was tough to go cold turkey on TV, the internet, e mail, phone calls, and even newspapers. There was withdrawal from the habit of checking out the Dow several times each day. Instead I finished a book on acting by Laurence Olivier, passing it along to Astrid, and am now a third of the way through Dostoyevsky's The Brothers Karamazov. 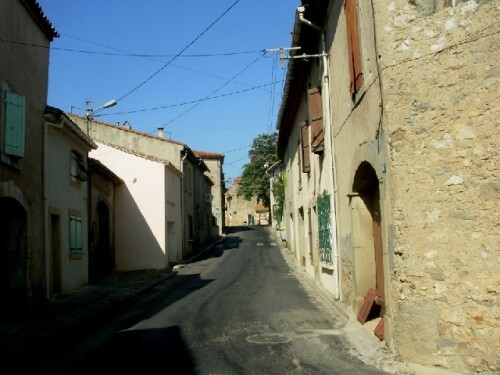 Ten days in a village in France so small that it can't be found on most maps was simply remarkable. It proved to be one of our greatest ever travel and cultural experiences. We settled in and became comfortable with a fascinating community half of whom are expatriates. There was a sense of real participation and security. We spent time with interesting, like minded artists, sponsors, and citizens. 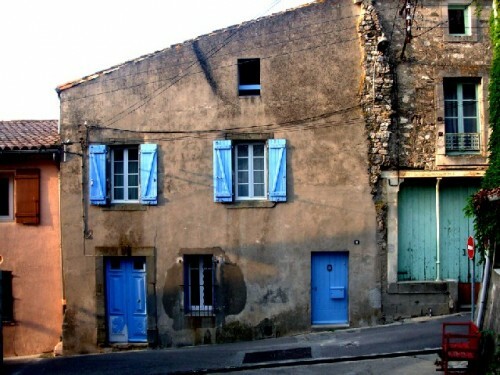 It provided an intimate glimpse into daily life in a French village. Just as it has been for centuries. We came to know a community in transition. Years ago, the dense cluster of buildings lining narrow streets were home to those who worked the surrounding fields of grapes. In general the soil is now poor and depleted. 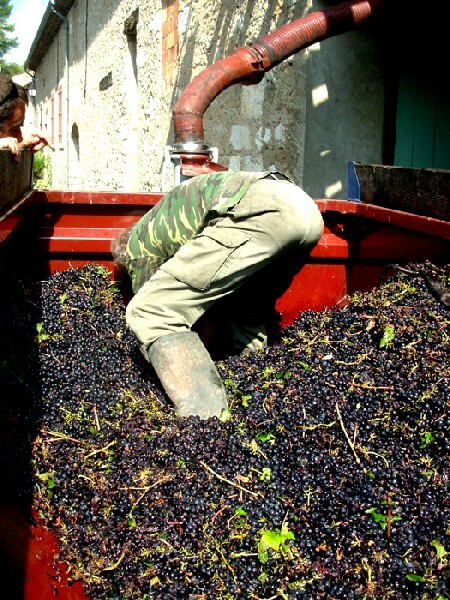 The region has long shipped its juice to Bordeaux to be mixed into blends or bottled mostly as inexpensive vin ordinaire. 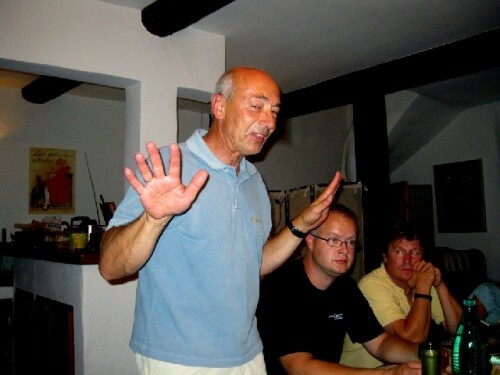 Recently there has been an effort to create boutique wines of greater quality. 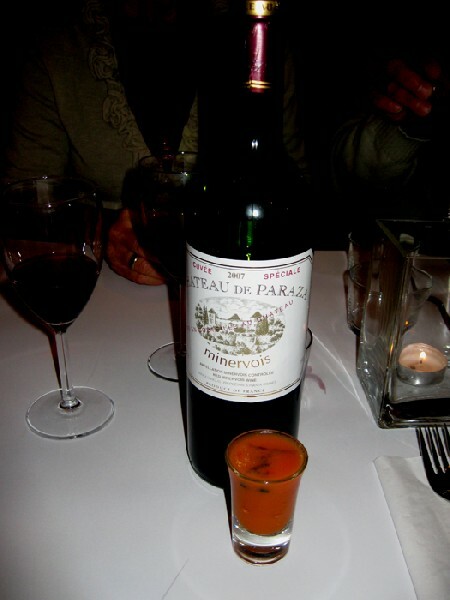 We sampled a superb Chateau Paraza which was rich and exotic. With automation there were fewer workers for the harvest and wine industry. 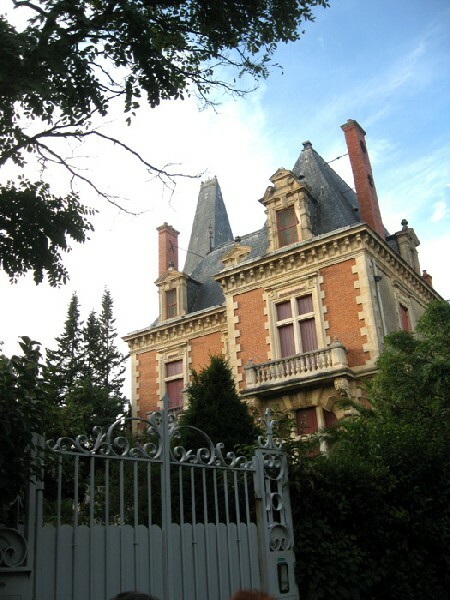 The great chateau and impressive homes of upper managers had changed hands. The young moved out or to more modern homes in new developments. Slowly the vacant properties are bought by people seeking vacation and retirement homes. During the off season many of the homes of the new residents are shuttered. A few years ago they were cheaper to buy and renovate but now less so. 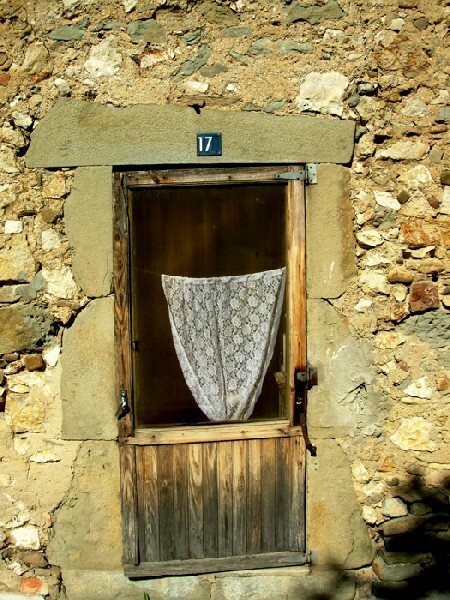 It is still possible to purchase a small home in not great shape for around 100,000 Euros or $150,000. Larger renovated properties are now in the range of 300,000 Euros. In conversations with residents, and through our own day trips and group excursions, we found that Paraza is well located. It offers that unrushed, timeless village life, but is just twenty minutes from Nabonne with its thriving markets and train station. There are nearby airports at Carcassonne and Montpelier. Ricardo discussed his frequent travel to London where his company is based and other business trips. In the computer age one may live just about anywhere near an airport. After assembling on Saturday the following day we formed a caravan of several cars and drove to the nearby, medieval village of Minerve. It is built on a promontory looking down into mountain gorges. We clambered about like mountain goats. 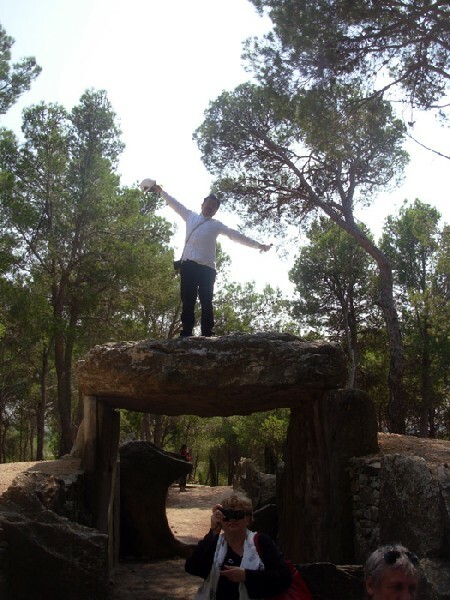 Then drove on to a picnic lunch in a Neolithic burial place in the middle of nowhere. Astrid and I had hoped to visit painted caves but this was as close as we got to the prehistoric culture that abounded in the region. There would be other excursions to the church and markets of Narbonne. Some of us went on to the beach which we had visited previously. The three Hungarian artists took a plunge in the Mediterranean. On another day, while the artists were in the studio, Werner drove Astrid and I to a nearby town on market day. We bought some salamis and cheese. 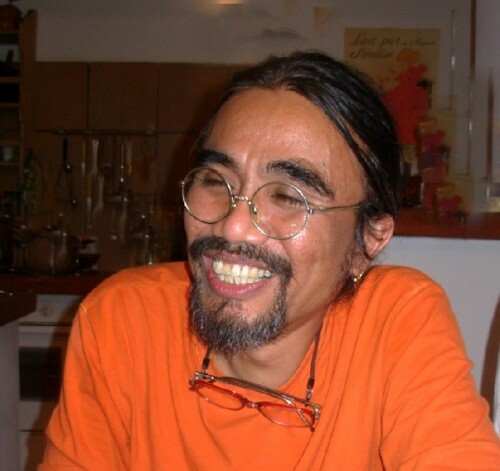 Takata came along as he was still "thinking" and looking for materials for an installation. One evening we all drove to a town to attend a vernissage in a rather grand and spacious community center and gallery. In Minerve there had been a fascinating gallery space and we found others during day trips. On our own we explored the medieval walled city of Carcassonne. The group visited on the following Sunday. 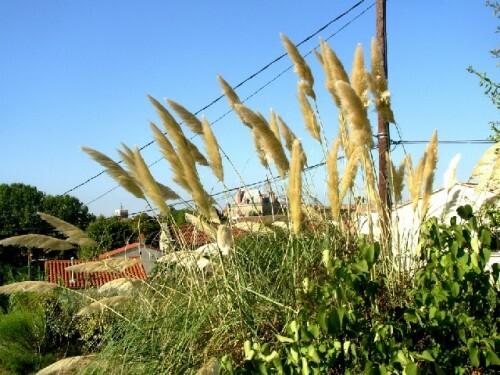 Located in south central France Paraza is relatively close to the Pyrenees and Spain. There is a short drive to Barcelona and seberal hours to the Basque country of Bilbao. Heading east Provence, the French and Italian Riviera are a few hours away. Many of the residents we spoke with said that they opted for Paraza as a more affordable alternative than the pricey real estate and congestion of Provence. We confirmed that during our travel finding destinations like Arles, Nimes, Avignon, and Aix daunting to negotiate. 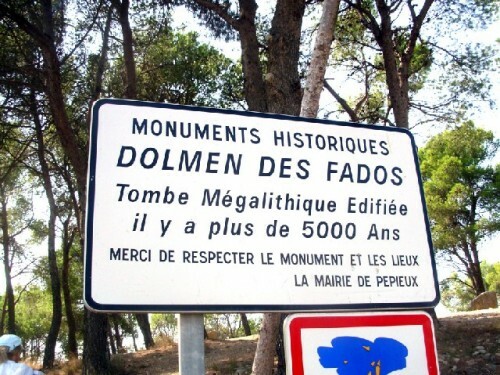 To say nothing of the overbuilt Cote d'Azure and the crawl of traffic along the coastal route during high season. Fortunately we negotiated that fabulously scenic strip mid week, and off season. With each passing day Paraza, our hosts, artist friends, and citizens of the village became ever more embedded in our hearts and minds. There was a sense of being secure and nestled into a circle of friends. The daily routine was low key, familiar, and charming. 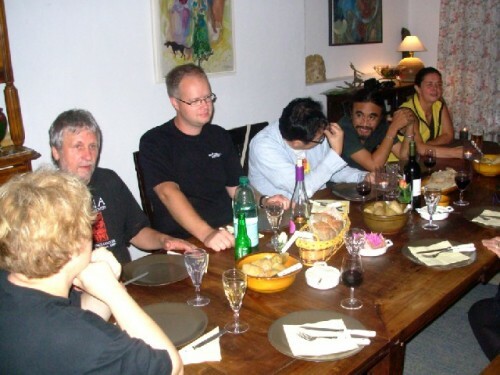 We were welcomed into the guest house of the Belgian couple of Dirk van der Elst and Mireille Schellaert. We enjoyed visiting Dirk's studio and there were several abstracted views of the village on the walls of our residence. An outdoor pool was wonderful for daily laps but seemed to get colder with each passing day. 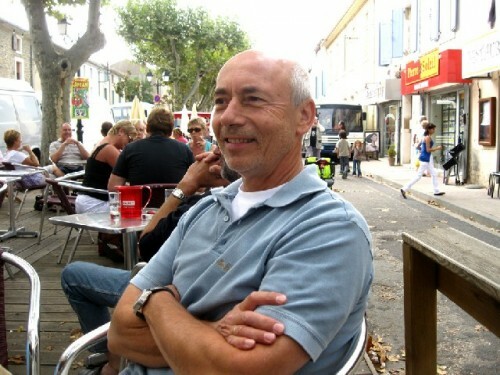 Dirk is the president of the organization Le Pont which, year round, sponsors cultural events for the community. Mireille is a life long equestrian and initially she had hoped to bring her horse to Paraza but it is now boarded elsewhere. One day we traveled with them to nearby sites. In the morning we enjoyed instant coffee and tea then made our way to the Endriss home for breakfast. The daily fare featured the European menu of yogurt, French bread, with an assortment of cheese, butter, jam, salami and pate. Not my usual cereal and one percent milk. We discussed plans for the day and visits to the studio. The artists, all painters, had decided to work together in one space. With the exception of Takata, who wandered about the village, and spent several days "thinking." 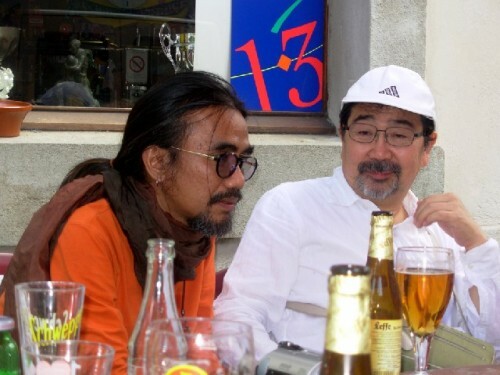 But he often hung out with the artists. Werner and Christine spent a lot of time observing the work in process. Many from the village also interacted. Particularly a fascinating neighbor, a German gentleman retired from the French Foreign Legion. He and his wife welcomed us into their home to show us a collection of artifacts. The walk from our cottage to the gathering place of the Endriss home was scenic and poetic. Our first encounter was with an angry dog fenced in front of a neighboring house. He always greeted us with ferocious barking. But with frequent passing he took less and less notice of us. Eventually, hardly bothering to lift his head for a casual glance. This was a sure sign that we had come to be accepted by Paraza's most vociferous critic. At the corner we turned up the narrow street past a large space devoted to grape processing. It was harvest time and we often encountered small, open trucks coming from the fields. Or the massive harvesting machines that pass over the rows of vines. There was the smell of rotting grapes. We made our way through the streets discovering short cuts and enticing alleys. Toward the end of the trip, a neighbor with a key let us in to see the small church which is essential to village life. It is kept by a couple who have a business of renting bicycles. She spoke to us with a Scottish accent while he is British. There was a lot of time to sit and talk with Werner and Christine. Astrid often spoke with them in German which I mostly understood and occasional joined in. I grew close to Werner who is wonderfully warm and open. At one point he said, as a compliment, "You are not like most Americans." To which my response was "You are not like most Germans." He had spent several months in New York on business some years ago. Recently they had traveled in the West including Vegas, the Grand Canyon, and National Parks. I enticed him with the attractions of the Northeast and the Berkshires. Mostly I was interested in how he and Christine came to sponsor the symposium. Not only did they house several of the artists but they also paid for all of the food for the incredible and terribly rich meals prepared by Babi. 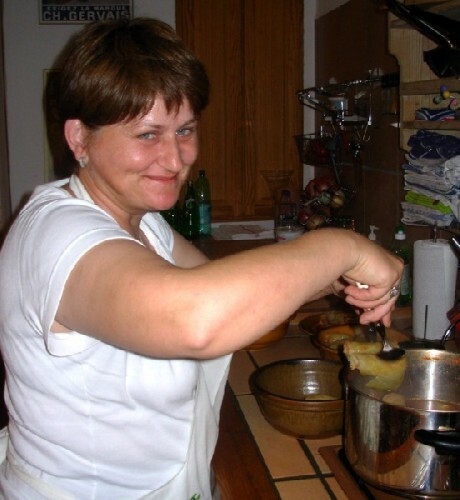 The Romanian born chef is a lifelong friend of Dorothea. Lunch often included a soup followed by noodles tossed with butter, crème fraiche, or sour cream . Evening meals were a hearty mix of stuffed cabbage, breaded chicken, and goulash. By the end of the trip I gained a pound or two. We all tried to help by clearing the table. When she and the three Hungarian artists departed there was an adjustment not having those regularly prepared meals. One night Toi prepared a traditional Thai fish curry over rice with fried eggs. For our last night in Paraza we joined Werner and Christine for dinner in the fine Cafe next to the canal operated by a British couple. They have a strong seasonal business based on the tourists who tie up boats and barges along the busy canal. There was a party of a dozen or so seated next to us. Over that last meal together with our hosts we discussed the success and challenges of the program. There were daily issues to be dealt with. Several of the invited artists, for different reasons, had not arrived. There were initial plans for several sculptors who were provided with materials that had not been used. Issues arose when plans were altered. The artists opted to work together rather than in studios around the village. Led by Dorothea the artists were in something of a frenzy to create a body of work sufficient to fill the generous space of the community run gallery. There was pressure to meet the deadline of the vernissage. As issues surfaced they were negotiated and solved by Werner and Christine in conference with Dorothea. The invited artists had participated on prior symposia organized by Fleiss particularly an annual summer event staged in a castle in Carei, Romania. All of the artists invited to this first event in Paraza had participated in the Romanian symposium which has hosted up to 75 artists. It is where Mary Sherman first connected with Fleiss. 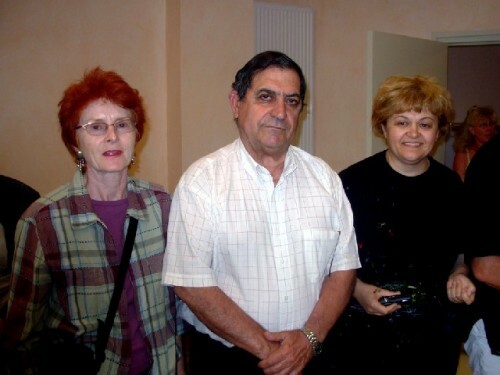 The artist daughter of Werner and Christine participated in the Romanian symposium Through this Dorothea and the Endirsses connected in Stuttgart and planned the event in Paraza. By that final dinner the four of us were exhausted but upbeat. 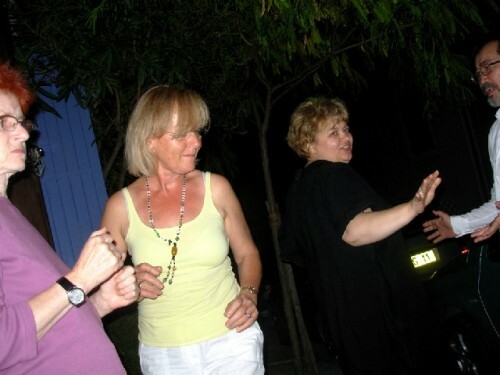 I was recovering from a health issue in which Christine and Johanna drove Astrid and I to the emergency room in Narbonne. It had been an ordeal but I was getting back on track. Travel is exhilarating but comes with wear and tear. There had been a wait of two and a half hours but the doctor was charming and helpful. Surprisingly there was no charge for the visit and a start on the prescription. Never having done this before there was a learning curve for Werner and Christine. Both took enormous pride and delight in the work that had been produced. They laughed when we suggested that next year they may participate in the studio sessions. Christine discussed how in the past she enjoyed making portraits. Werner would like to work with wood and stone. We basked in their remarkable spirit and generosity. Walking back through the village with them we passed the tree lined streets and discussed ideas for the next symposium. I suggested that they invite some artists interested in creating site specific works and public art; to take advantage of the natural topography and embrace the village as a work of art. 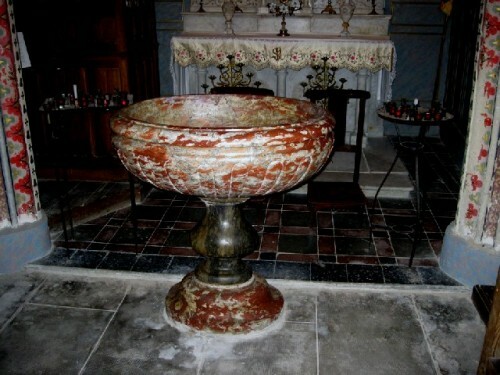 During our visit to Minerve we noted the local stone a mottled, red and white marble. It is mostly used decoratively for tiles and church ornamentation. Werner was excited about seeing if they might get some of this material donated for a visiting sculptor. They were full of ideas and energy on how to sustain and expand the program. 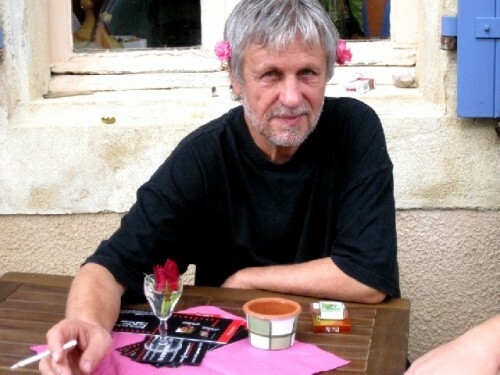 In particular I will linger on those wonderful conversations with Werner. The playful bantering with Takata. Meaningful exchanges with Toi about his work in Thailand. The fabulous meals prepared by Babi. Those eye conversations with Lyudmila which spoke volumes. The energy of Dorothea and those raucous song fests into the night led by the Hungarian artists, Mathe, Maklary and Istvan. The warmth of Ricardo and Sandie. Challenging and probing conversations with Ursula. The graciouness and hospitality of Dirk and Mireille. And yes, our friend the village's hound of the Baskervilles. Indeed it takes a village. In our next report on Paraza we will discuss the work produced in the studio and its resultant exhibition. Astrid interviewed the artists and many of the residents in the village for her continuing coverage. We will also post reports on further travel and experiences in the South of France. 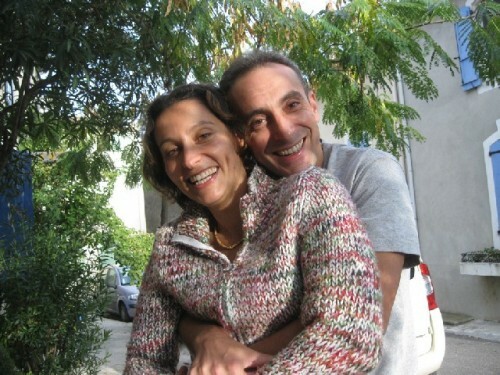 "Wonderful to read your account of Dorothea and Paraza! 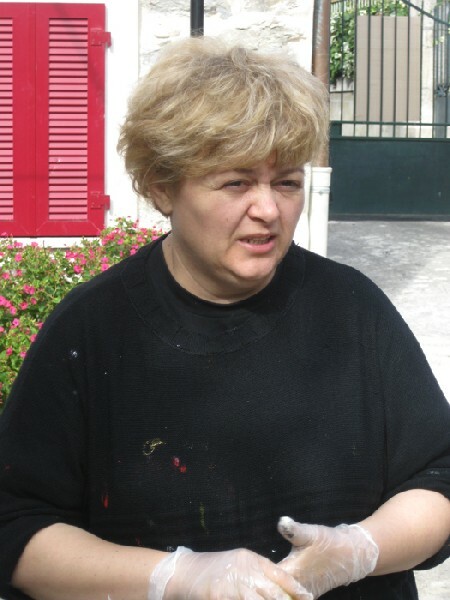 I know Dorothea thorough Mary S. This September, I was lucky enough to participate in the Hudek International Art Symposium in Croatia (which grew out of a connection made in Finland at the Hovinkartano Art Center.) Intense art making combined with intense playing--dancing, singing, and general carousing at night--great! Album of images are posted on my FB page. "